When it comes to the security of your VMware infrastructure, having efficient monitoring of activity and trustworthy reporting on changes to system settings may not be enough. There is always a chance that a critical change, such as a change to a VMware vCenter Server, goes unnoticed, wreaking havoc with the availability of your whole system. VMware alerting on critical changes can give you peace of mind, because you will no longer have to worry about missed log events in vSphere Client that can jeopardize your VMware security. VMware email alerts will keep you abreast of the actions that you deem suspicious, so you will know about insider threats in minutes and can rapidly remediate them. To strengthen the security of your virtualization technologies, vCenter Server provides VMware alarms that are triggered by potential performance concerns or resource usage. 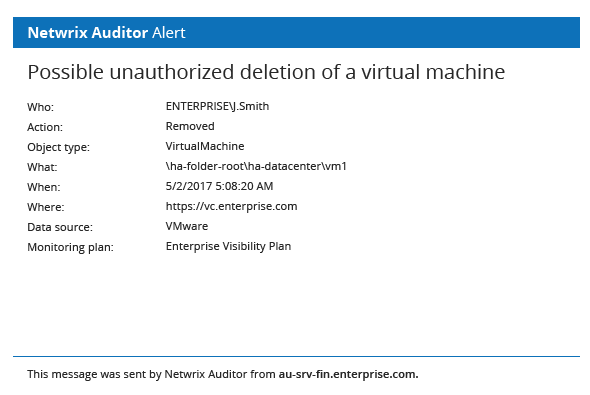 These alerts can be attached to any object within vCenter Server and provide a good way to proactively alert the vSphere administrator. However, these alarms, together with regular monitoring of activity on your virtual machines, are not enough to shield your VMware vSphere or ESX/ESXi hosts from the increasingly sophisticated insider and outsider threats that you face today. To be sure that no unwarranted change slips by unnoticed while you are busy with other tasks, you need the advanced protection of streamlined VMware ESXi email alerts. The more near-real time information you get about what is going on in your VMware environment, enriched with detailed content about every change, the better your security posture. With efficient VMware monitoring and alerting combined together, you can stay on top of critical changes and thereby minimize the risk of downtime and security failures. Fine-tune the alerts to the changes you find most critical, such as virtual machine or VMware snapshot deletions. Be the first one to know about aberrant activity across your VMware environment with detailed notifications about critical changes. Slash the time required to respond to suspicious activity, and thereby better shield your sensitive data.